20 year old Mega-Million Winner looks like a Celtics Fan - How Cool? 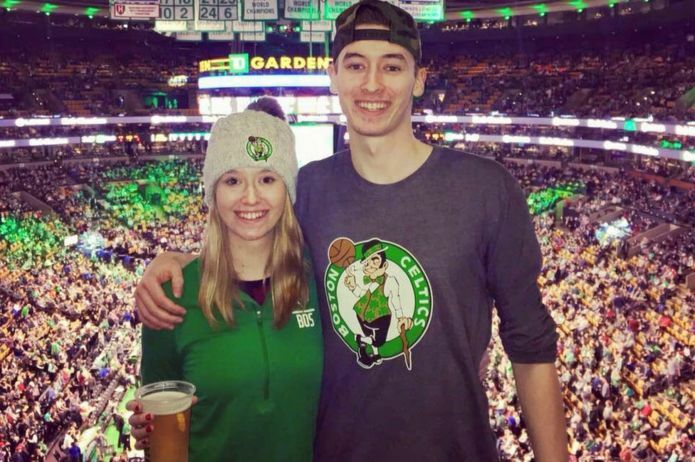 Re: 20 year old Mega-Million Winner looks like a Celtics Fan - How Cool? He was wearing a Cs shirt in another pic I saw on TV. Maybe we can get him on the blog. Seems like an interesting young man. Good for him - hope he uses it well. Will he be my friend? I noticed that picture also...congrats to him for both being lucky and for at least being able to attend a Celtics home game in his life! He’s gonna need a good financial advisor. A 20 yo with $250 million after tax. Scary. If I won that kind of money I’d try to get a minority stake in the team. Congrats to him and I hope he uses it wisely. Here's hoping that we "Hit" in June 2018, 19, 20, 21, 22....or at LEAST TWO of those years. Wow in 2022 Kyrie will be ONLY 29...but back on subject.. Seems like Danny has already "Hit" with JB, JT and Smart, as well. Maybe he's one of us. Haven't seen many posts by FLCeltsFan this week, which I'm sure has absolutely nothing to do with the fact that the C's had only one game. Maybe it was her son/grandson/nephew? Or maybe nickagneta, I think he moved to Florida a couple of years ago and has a few sons. Maybe him. Or one of the several other posters here who also live in Florida! As pathetic as this sounds, I've actually thought of this before, but if I ever won the lottery one of the things I'd do is pay for a full season of whatifsports SimLeague Basketball for myself and 23 other posters here, so we can finally do a CB Historical draft right, and battle it out and settle the debate once and for all about who actually put together the best team. Brought it up once before, but only a couple of posters were interested in paying the $10 necessary to do it. So $240 would be my big splurge on you guys. A 20-year-old from Florida says he plans to "have some fun" after being named sole winner of a $451m (£330m) lottery jackpot. Shane Missler matched five numbers and a bonus ball to scoop the fourth largest win in the US game's history. He opted to receive a one-time payment of $282m, instead of the full amount over a longer period of time. Mr Missler said he had a feeling he could win on the night of the Mega Millions draw, says a press release. Thanks everyone it was crazy winning this but I’m coming clean. I’ll be making an offer to wyc soon to buy the entire Celtics team. If he says no I’ll try to just buy half or something, or I’ll just buy the td garden. Haven’t decided.